Magic Johnson while playing with the Lakers, c. 1987. 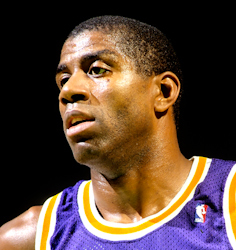 Earvin "Magic" Johnson, Jr. (born August 14, 1959) je agba boolu basketi to ti feyinti omo ile Amerika. ↑ Magic Johnson - historical player file. www.nba.com. Retrieved March 28, 2013. Àtunṣe ojúewé yi gbẹ̀yìn wáyé ni ọjọ́ 28 Oṣù Kejìlá 2013, ni ago 22:08.